The Mauritius Meteorological Services plays a vital role in providing services for various maritime activities of socio-economic importance. The safety of life and property at sea. The provision weather information in the event of any impending marine pollution in case of oil/chemical spill or capsize ships. The provision of specific weather forecast for all maritime leisure/recreational or commercial activities. The provision of appropriate data, information, products and services required to investigate the impact of climate change and variability on marine activities. 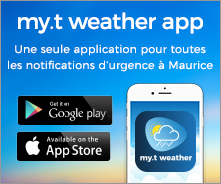 In order to ensure the safety of fisherman at sea the Mauritius Meteorological Services issues weather forecast for fisherman of Mauritius and Rodrigues twice daily. To ensure safety at sea for other ships en route forecast for any ships moving to outer island are provided upon request. The MMS also has international obligation where there is active participation in the Global Maritime Distress and Safety System (GMDSS). Along this line 24 hour forecast are issued for METAREA VIII (S) which extends from 550 E to 950 E and from 000 S to 300 S and this forecast is used by any ship to plan their navigation in that area. In order to fulfill its obligation towards providing data services the MMS has different instrument in places. These tide gauges monitors sea level change due to global warming in the region. They also form part of a global network of tsunami watch station monitoring abnormal sea level changes due to tsunami and thus serve as an important input for the early warning of tsunami waves to other South West Indian Ocean Islands and the East African countries. The wave rider buoy launched in September 2009 off Blue Bay coast monitors high waves and has been very useful to warn fishermen and the general public of the rough sea state conditions in the vicinity of Mauritius. Another wave rider buoy managed by the MOI provides sea state in the northeast. This instrument is used to profile sea condition from the surface to a depth of around 2000m. The MMS participates actively in the ARGO Programme where about 3000 such instruments have been planned for deployment. The data are collected and archive and are made available to the users through the NODC website. The marine section at the MMS monitors SSTs observation in the region and produce fortnightly and monthly SSTs maps for the region bounded by 000S – 350S and 350 E-900 E. These maps are published in the monthly weather summaries. Annual tidal predictions are computed using the University of Hawaii sea level tidal prediction software. This annual prediction is included in the Ephemerides publication. Weather about sea state is reported to this office by officers of the Ministries of Fisheries posted in the different fisheries post. This report about the sea state is compiled for future use. The MMS also provide training/sensitization programme to enhance the capacity of fishermen and any other stakeholders involved in maritime activities. There are numerous requests for tidal prediction, sea surface temperature in the lagoon, wave data and past weather over the sea for insurance claim purposes where the data from the MMS find its importance.